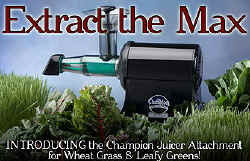 The Wheatgrass Attachment attaches quickly and easily to the Champion Juicer. 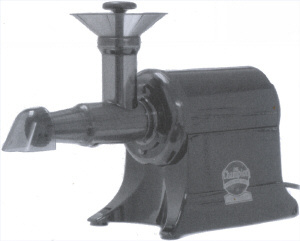 This eliminates the need for a seperate appliance for juicing wheatgrass and other leafy green vegetables. Easy to use, Perfect for juicing Wheat Grass, Barley Grass, Sprouts and other Leafy Green Vegetables. The Wheatgrass Attachment Helps you to Drink more Fresh, Vitamin Rich Green Juices. The Wheatgrass Attachment for your Champion Juicer allows you to prepare your family's favorite green juices at every meal. Research studies have shown a direct relationship between diet and health. Fresh green vegetable juices are one of the healthiest things you can do for your body. THE GREENS ATTACHMENT is specifically designed to juice wheatgrass. Other leafy greens, such as kale and chard can also be juiced. However, lower yield than that of the wheatgrass can be expected. Constructed of BPA-Free Eastman Tritan CoPolymer and Nylon, the Champion Juicer Wheatgrass attachment is built to last. Operated by the Champion Juicer's heavy-duty 1/3 hr motor, the Wheatgrass attachment is easy to clean using the included nylon bristle brush to clean the stainless steel juicing screen after juicing. The Wheatgrass Attachment has a 1 Year Limited Warranty. This Champion Wheatgrass Attachment has the magnet built-in to prevent the juicer from operating when the attachment is not properly installed onto the champion. 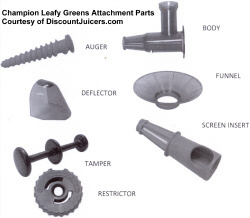 Please Note: This Champion Wheatgrass attachment ONLY works with certain model Champion juicers made after 2003. To determine if the champion Wheatgrass attachment will work with your juicer, your serial number MUST be higher than the number below. This Item Fits the following serial numbers and above.